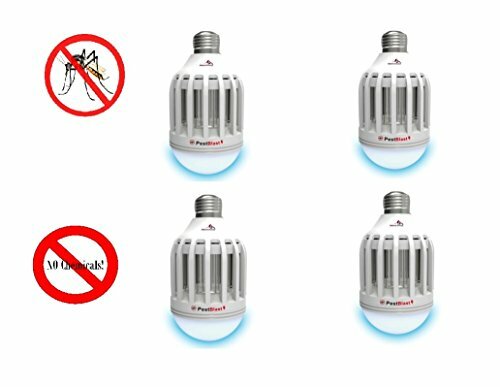 Pestblast is a powerful LED light with an electric zapper all in one to cure the annoying insects we are all accustomed to, including ones that carry terrible diseases such as the zika virus! Very easy to install and operate, just think of the regular bulb you have at home. (Not compatible with dimmer switches) simply turn the power off before inserting the pestblast in any 110V socket. Once the bulb has been inserted, turn the switch on to activate both the light function and the zap function. To activate the zap function only, simply turn the light off and on again. To activate the light function again, toggle the switch once more. That's it! Easy!! All flying insects that are so annoying and harmful are quietly and consistently destroyed with this pestblast 2 in 1 creative zapper. Simply the best and most convenient zapper for use anywhere and everywhere! The pestblast does its work perfectly and you don't need to worry about any harmful toxins or chemicals associated with sprays or powders. It also eliminates any and all safety concerns for children and pets. Easy to clean if necessary: There's even a free brush included to keep the zapper clean. Can be used year round for bright lighting and insect zapping anywhere indoors or outdoors. The pestblast is a must have in every home and office. Every living space and work space will benefit greatly from using this. Get a 4-pack to keep mosquitoes away from all rooms. If you have any questions about this product by Above Edge, contact us by completing and submitting the form below. If you are looking for a specif part number, please include it with your message. Synergetic Green Bug-Attracting Bulb 15W 18"